Today, I have a special guest, Amy from Diary of a Quilter. I met her at a quilt tying activity for Japan after the earthquake back in 2011, and through various bloggers meet ups, lunch dates and emails back and forth, we have become really good friends. 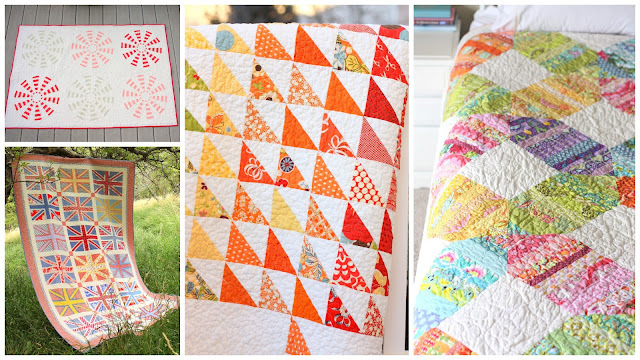 I love the quilts she designs, she has an eye for coordinating colors and they are just so lovely. I would recommend her pattern shop as a "must visit" place. I am so blessed to get to know her in person because she is not just a talented quilter, but also, she is one of the sweetest people I know. She is always ready to lend a helping hand to those who are in need and is very genuine and kind to everyone. No wonder she is loved by so many! When you visit her site, you will see what I mean. :) I am so excited that she agreed to help me out and be one of the guest bloggers while I am in Japan. Ok, everyone, here is Amy! Hello fellow Tea Rose Home fans! 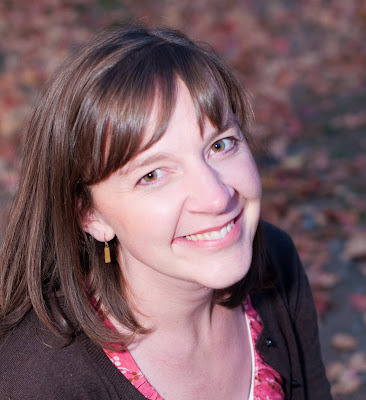 My name is Amy Smart and I write about my sewing adventures at my blog, Diary of a Quilter. One of my favorite parts of writing a blog is connecting with other younger sewers/quilters out there. I love all the creative inspiration to be found in blogland. I especially love to bring people over to the dark side teach beginning sewers and quilters how to get started. I've written a whole series about choosing fabric, patterns, supplies, and actually beginning to quilt. You can find the Beginning Quilting series here. In addition to simple quilts, I also love to make bags, skirts, and baby gifts. You can find other tutorials here. I was so excited when Sachiko invited me to be a guest at Tea Rose Home. I am in awe of her gifts and talents as well as her generosity in sharing those talents. She is as lovely in person as she comes across on her blog. Today I'm going to share a simple little project. I like to carry portable sewing projects around with me - I'm especially productive on long road trips. But I have a bad tendency to leave stray pins all over the front of the car which is not a good thing, especially when you drive multiple car pools. So I created a little magnetic pin box to help me keep track of my pins and needles, not only in the car, but in my purse and the rest of the house too. Trace the top of the Altoids tin onto your wool/felt and mark any letters, designs, etc. you would like to add. Stitch over the writing using an embroidery needle and cotton floss. Add any embellishments. Do this BEFORE you cut out your shape. Using a hot glue gun or E6000 glue, carefully glue your embellishment on the lid of the Altoids tin. I like these magnets because they are thinner than regular magnets and a lot stronger. I did not even glue it in place - just attached it to the inside of the tin - which is nice because then it's easily removable if you do want to carry it in your purse. And there you have it - a quick project, perfect for your own needs or gifts for your crafty friends as well. I've used the same technique for magnetizing bowls to create your own pin dish, also great for paper clips and other office supplies - not just sewers! Thanks so much for having me Sachiko! It is an honor to be a guest at Tea Rose Home. How fun to have Amy as the featured guest today! I ditto everything you said about her! Two of my favorite bloggers in one place! How delightful! Thank you Amy for the great tutorial! When I was a kid, my mother had a magnet to collect scattered pins, yet your idea never came to my mind! Such a simple solution! Thank you for sharing! Caution for parents with small kids magnets can be very dangerous for kids if swallowed. I strongly suggest gorilla gluing down the magnet to the case. Wonderful idea - I am going to make this. Thank you!! !